One More Reason There Will Always Be A Place For Books! Thank you Pat for allowing us to share this wonderful cartoon! LOL. Thanks for sharing. By the way, I plan to read Fifty Shades of Grey too. On my kindle. Maybe at the beach. I prefer print! I can toss it, sit on it, throw it in the backpack, take it on a hike etc…nothing is better than the good old fashioned book! Welcome Susan! Good point. Also, they don’t ever have to be charged! Hope you are baking something good today. Very funny! 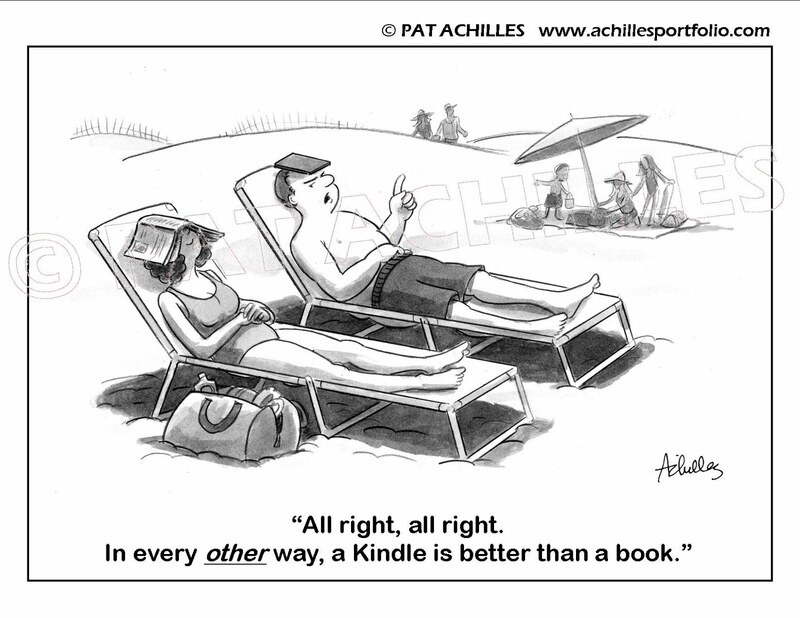 I think I will leave my kindle home when I go to the beach! Very funny, Susan! I hope you don’t mind if we steal this and post it on our FB page. We’ll put the link to your blog with it! Deal? Deal! I actually emailed Pat and asked if it was ok to post it. She said yes, so I assume she would be happy to have more people checking out her cartoons! Thanks for stopping by!